Amira Nature Foods Ltd (NYSE:ANFI) , a leading global provider of branded packaged Indian specialty rice, is introducing the Amira Food Truck at Natural Products Expo West on March 6-8th in the United States. 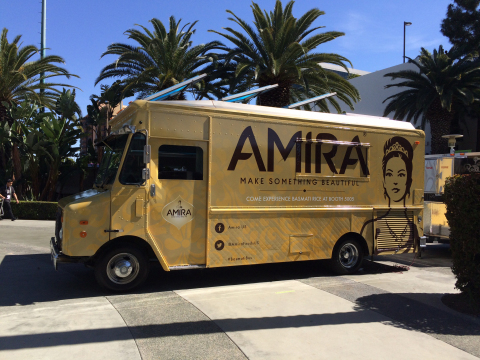 The “Basmati Bus” will be parked outside of the Anaheim Convention Center in California to serve free dish samples featuring Amira branded products to all show attendees. The show’s attendance is expected to exceed 60,000. The “Basmati Bus” will be making appearances at several events throughout the year. For more information, please visit www.amira.net. This press release contains statements of a forward-looking nature. These statements are made under the “safe harbor” provisions of the U.S. Private Securities Litigation Reform Act of 1995. You can identify these forward-looking statements by words or phrases such as “may,” “will,” “except,” “anticipate,” “aim,” “estimate,” “intend,” “plan,” “believe,” “is/are likely to,” “future” or other similar expressions. We have based these forward-looking statements largely on our current expectations and projections about future events and financial trends that we believe may affect our financial condition, results of operations, business strategy and financial needs. These forward-looking statements include, but are not limited to: our goals and strategies; our expansion plans; and our future business development. We would like to caution you not to place undue reliance on forward-looking statements and you should read these statements in conjunction with the risk factors disclosed in “Risk Factors” appearing in our Annual Report on Form 20-F as well as other public filings with the Securities and Exchange Commission. Those risks are not exhaustive and reflect our expectations as of the date of this press release. We operate in a rapidly evolving environment. New risk factors emerge from time to time, and it is impossible for our management to predict all risk factors, nor can we assess the impact of all factors on our business or the extent to which any factor, or combination of factors, may cause actual results to differ from those contained in any forward-looking statement. We do not undertake any obligation to update or revise the forward-looking statements except as required under applicable law.